have in your hand Tapper Roots. 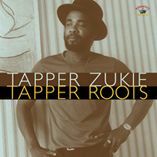 ‘Freedom Street’ and the title track ‘Tapper Roots’ all are embedded with Rasta meaning. a message to the youth that violence was not the answer in ‘Simpelton Leave Violence’. the latter of which remained on the Jamaican charts for six weeks on its initial release. and recorded an albums worth of material. He would later get the band signed to A&M records. On The Ball , For One and All..